As aussie is an american breed , I decided to go to see it and learn about the breed and "all about aussie and breeding" in USA. 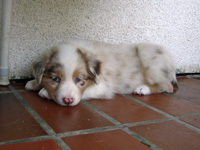 2004 I visited ASCA National Specialty in Paso Robles, California where I had the oportunity to attend many workshops with CA Sharp as well as admired aussies in breeding ring, working live stock, obedience, agility, tracking. 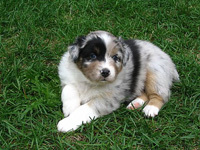 According to the standard I keep in mind an Australian Shepherd as a moderate sized, athletic dog with not to much bone and coat. Healthy in mind and body, intelligent, versatile , beautiful and loyal friend to his owner. Parents of our puppies are carefully chosen on temperament and health checked for HD, most of them ED, eye checked before breeding, MDR1 tested and DNA tested for cataract HSF4 and other DNA tests. Puppies are whelped in the house and live in the house with the family and the other dogs. The "puppy time" is something special for me and that's why I spend all my time with them. A good socialization in the early period of life is very important, so I do everything to achieve this goal: contact to people, children, driving with a car, as many as possible different situations including sounds, noise, vacuum machine, etc. 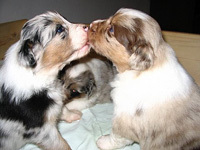 For I know each puppy quite good, I can help to choose the right one for the right person. 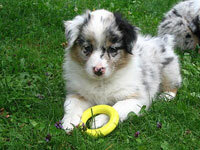 We do Volhard Puppy Aptitude Test for working dogs at 6 weeks of age. The color of the coat or eyes or a gender is less important but I also try to comply . As I strive to keep the versatility of the breed I'm looking for the people, who will keep their aussie busy in any activity - busy in body and mind - no kennel life. Basic obedience with a good trainer is a must as well. Puppies are sold with a contract, vaccinated, their eyes are checked at 7 weeks of age and are checked by a vet. Each owner gets a map with documents and certificates as well as the copies of health certificates of the parents. I carefully screen all puppy buyers put a lot of questions and expect also a lot of questions of them which I like to answer. I expect to keep contact with the owners, to let me know how the dog develops and I'm always here to answer the questions and give some advice. For reservation, demand the questionnaire.